Tonight we went on a double date with Jon & Sarah! That hasn't happened in forever. (A date...or a double date). 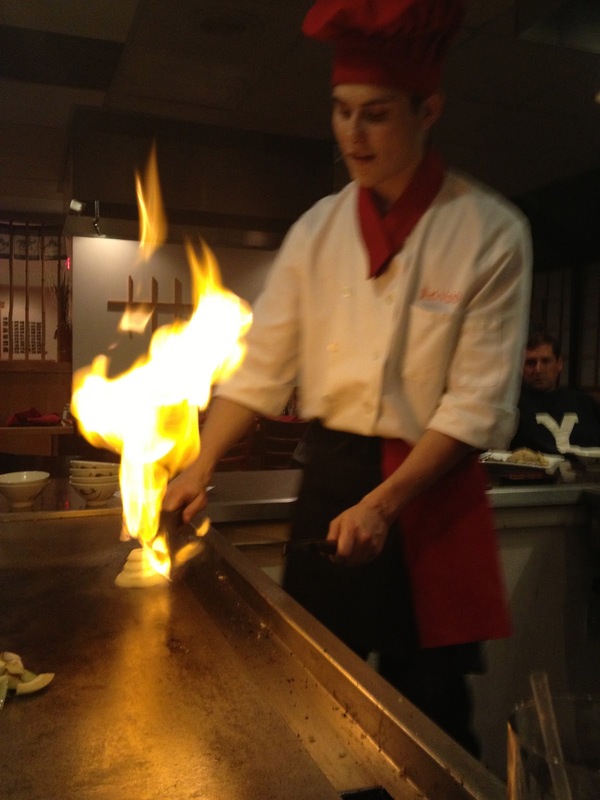 We hit up some temppanyaki in Provo (which ultimately just made me miss Yamato's back home). Some day I really want to learn how to do that. 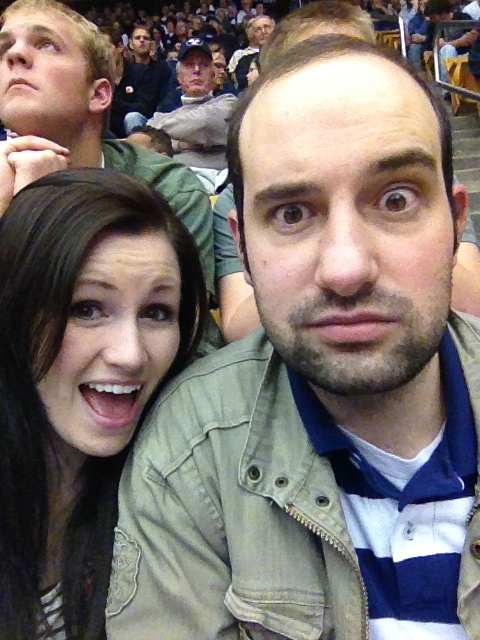 Then we went to the BYU basketball game. On the way down I told James, "I don't think I've ever been to a BYU basketball game.." To which he responded, "Uh..yes you have...that was our first date." Come to think of it I have a vague memory of that. I could've sworn I had a picture for proof, but after searching through all my pictures from college for like 30 minutes...apparently we don't have a picture from that date. I think he went for the post Red Bull energy crash look. As Sarah and I were watching the student section and all of their enthusiasm and rambunctious cheering, I told her I felt like that part of my life was soooo long ago. She said she couldn't believe how much energy they had (something an 8 month along pregnant girl would notice). Ohhhh college. Good times. 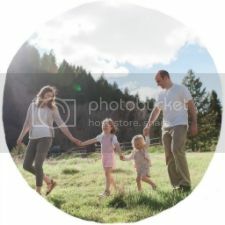 It was fun to be all nostalgic. Except I totally forgot the fight song. I guess I'm not that big of a Cougar after all (totally okay with that). On an unrelated note, we busted out the Christmas decor today! Usually I'm not one to get out any red or green until December 1st, but this year I couldn't contain my excitement. I even taught Jillian how to say "Santa!" EEEE!!!!! 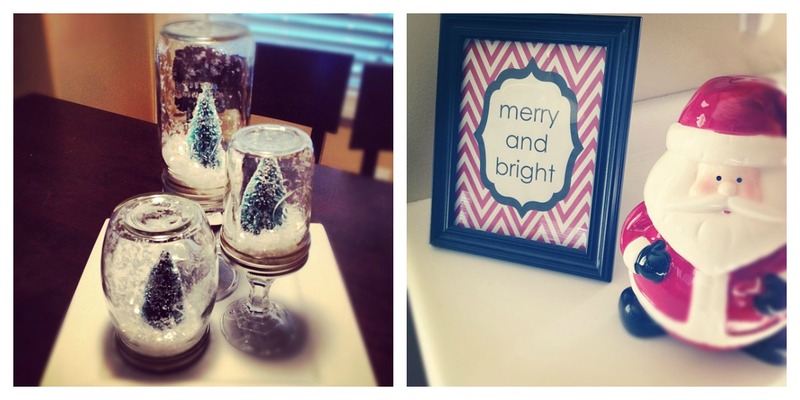 I spent all afternoon working a ton of craft projects (finished the snow globes, glitter reindeer, and chalkboard sign today!). I'm still working on some giant glitter ornaments out of styrofoam balls. My back porch is incredibly shiny and I might have ruined some patio furniture (ruined could also be interpreted as "enhanced with clumps of glitter").